I have tell the story about where I am going in Ubud, Bali. Now is time for me to tell you the story about the hotel I've stayed. Its name is Gita Maha Hotel. According to all the websites, this hotel just have only two stars. But, two stars doesn't make this hotel is at their standard services. 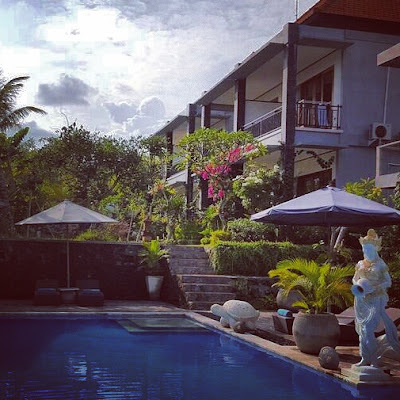 Located at the Tegalalang Village, Ubud Bali, this small and quite hotel is really a good place for you to release the tiresome after go around Ubud. The quite surrounding makes you really enjoy your relax time here. 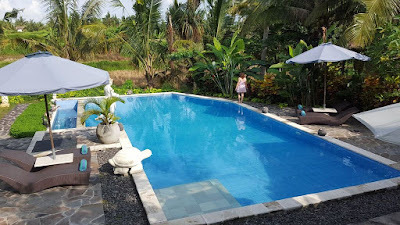 This hotel also have a very clean swimming pool, and you can see the paddy field near the swimming pool. Since the hotel only have 8 rooms, feels like you own the place. The staffs and services are amazing. They always smile all the time, and willing to help us anytime. Before we came, my boyfriend booked the hotel right to its website, and asked for room in the second floor. When we came, they gave us the room at the first floor. Then I told them that we choose the second floor. Of course they apologize and then asked us to wait until they finish preparing the room that we need. 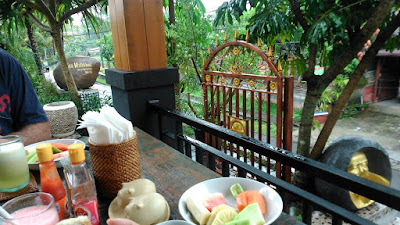 Luckily, when we finish going around Ubud, they already prepared our wanted room. The room was so big and clean. You will not going to believe it's only two star hotel. It's very clean, and they provided everything, bath amenities, (not so) mini bar; because they have a human size refrigerator, and you will have cold drink there. What I like from my room is the bathroom. It see trough *hehehe, and also they put the toilet into a smaller room, apart from the bath room it self. 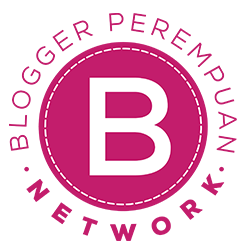 Standard amenities like towels and soap are provided by them. Shower and bath tub are places separately. Even thought the shower places is a bit smaller (you can't dance inside the shower), but for someone who doesn't like wet floor it's acceptable laa.. The balcony is sooooo great. Each room is prepared with the huge sliding door. 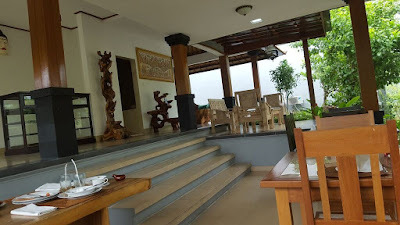 For first floor, the sliding door is the entry to your room, for the second floor, the sliding door is connected with the balcony. At the balcony, they provided a pair of chair and table. 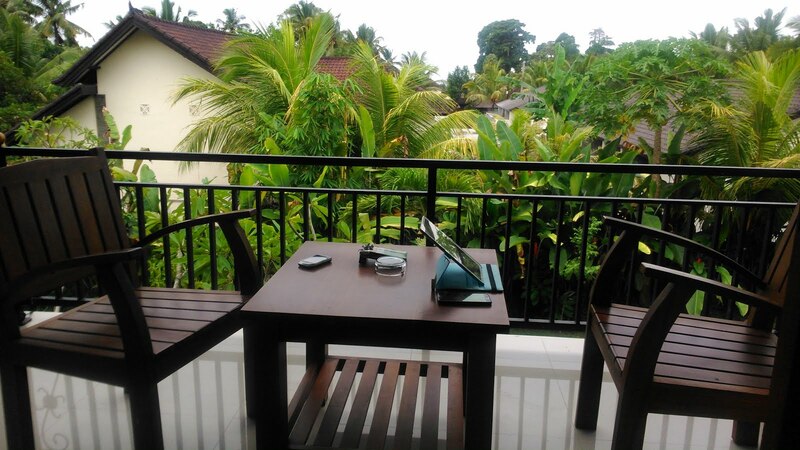 You can relax while watching the scenery or even just wasting your time at the balcony and reading, playing a game, or anything. Actually we asked for balcony that face the pool and rice field, but since the room we wanted was taken, so we have the balcony that face the road. 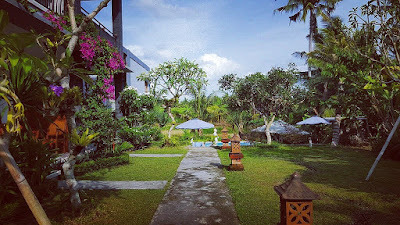 Not too bad too, we still can see their small and beautiful garden, pool, and rice field. Don't worry about the noise. Because the road is mostly very quite. I guess it is because the hotel is not placed at the main road, so when you decided just stayed at the hotel all day long, you don't have to worried about the noise, except if you are really annoyed with dog sound. At night, it became really quite, and sometimes you can hear the vehicles passed by, but when it's after 10pm, it's really calming quite, and only the sound of dog. Overall, I love my room. Very clean. And they always clean the room everyday. 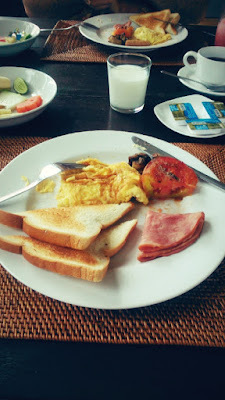 So if you planning not to go everywhere in one day, you can just come into their small restaurant, and having a breakfast and chills there. They don't have 24 hour restaurant at this hotel. Their restaurant just served breakfast. It open from 6am until 11am. But don't worry, you can stay there as long as you want. The menu is super amazing. Even you just want to eat one menu, but they will add lots of things together with you requested menu. We always eat scramble egg, and they offer the mushroom, ham, and half pieces of big tomato. And always with fruits, banana, watermelon, melon, pineapple. Oh, you must have the coffee in their restaurant. Their coffee is delicious. Not to say that they coffee is the best, but, for starting your day, they serve the best coffee. Their restaurant is near the road, and it's an open air restaurant. So you can chill there as long as you want, and enjoying the scenery. Is it only just a scramble egg? of course no, you can have a toast too, or pancake. The pancake is available on kids menu, but you can asked them to make one for you. The pool in this restaurant is always clean. I love how we can see directly into the rice field at the back of this hotel. So you can swim and relax. 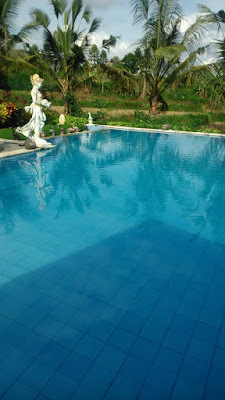 The most best thing is that we didn't worried about the other guests, because when we used the pool, it's just only us there. Maybe if you want to have a pool to your self, I suggest you watch and learn the behavior of the other guests. In my time, all the guests like to swim at morning. And when we use the pool is at the afternoon. It's the time when mostly the guests going to the Ubud center. Don't worry about the hygiene, the pool is always clean. They have a automatic pool cleaner. The machine is worked around morning and afternoon. Of course it will not bother your time at the pool. Don't worry about how to get to the Ubud Center from this hotel. Since this hotel is a bit far from the Ubud center, you will need vehicle to go there. 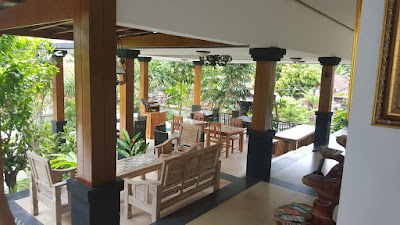 But worry not, because this hotel is providing the shuttle for taking you to the Ubud Center only. Follow their schedule, and you will be taking there for free. But when you want to go to Ubud without following their schedule, dyou don't have to worry, because they able to take you there with Rp50.000,- because you use their car outside their schedule. But for you who didn't want to spend that much every time you go to Ubud Center, you just asked them to rent a scooter. For Rp80.000,- a day, I think it will be worth it, since you can use the scooter anywhere any time. Wow! The staffs are really friendly, and really helpful. Just asked them to do anything and they willingly to do anything. Great tips for them also makes them smile brightly... LOL. Bad Indonesia language? No worries, they able to speak English. Some of them maybe can speak other languages too.